Afghan officials said at least 30 civilians were killed in the fighting, mostly from the airstrike. Mallya declined to say what the U.S. knew about civilian casualties or whether the incident was under U.S. investigation. In a prepared statement, he said the U.S. investigates every "credible allegation of error." And he said U.S. and Afghan forces were unaware of any civilians in or near the compound. A spokesman for Afghanistan's Interior Ministry says at least 10 people have been killed and 19 wounded in a coordinated attack by Taliban insurgents that targeted a security firm in the eastern part of the capital Kabul. Najib Danish says a suicide bomber detonated his explosives and then other insurgents started a gun battle with forces in the area. The Taliban claimed responsibility for the attack. 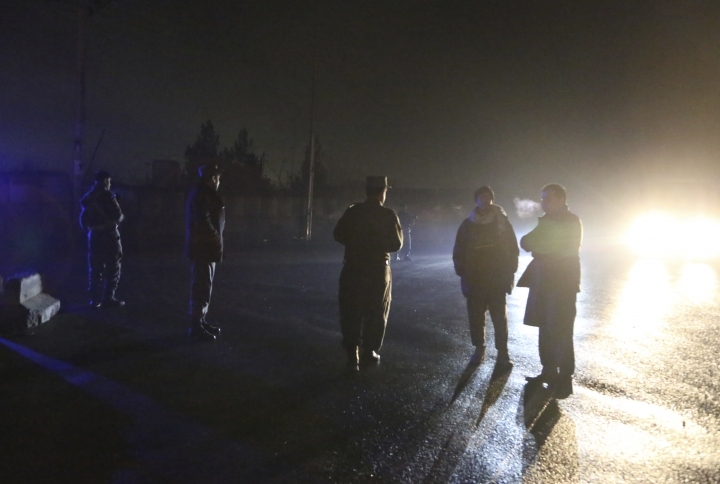 Basir Mujahid, spokesman for the Kabul police chief, says the target of the attack was a security company called G4S. He said the company offers training for Afghan security forces. A spokesman for the Afghan Public Health Ministry says at least one person has been killed and 12 wounded in a coordinated attack by Taliban insurgents against security forces in the eastern part of the capital Kabul. The wounded have been transferred to hospitals from the Wednesday attack site, says Wahid Majroh. Officials say a suicide bomber detonated his explosives and then other insurgents started a gun battle with forces in the area. The Taliban has claimed responsibility for the attack. Basir Mujahid, spokesman for the Kabul police chief, says security forces have started a clean-up operation and there is no sound of gunfire. The forces are looking around for any other possible attackers, he added. A spokesman for the Kabul police chief says at least six people have been wounded in a coordinated attack against security forces in the eastern part of the capital Kabul. Basir Mujahid says the six were transferred to a hospital for treatment. Officials say a suicide bomber detonated his explosives Wednesday and then other insurgents started a gun battle with forces in the area. Mujahid says security forces are in control of the area and there isn't any shooting now. Mujahid says initial reports indicate that the target of the attack was a security company called G4S. He couldn't provide any other details on the company. Najib Danish, spokesman for Afghanistan's Interior Ministry, says there's been a coordinated attack against security forces in the eastern part of the capital Kabul. He says a suicide bomber detonated his explosives Wednesday and then other insurgents started a gun battle with forces in the area. Danish says there are casualties but the number of dead and wounded was not immediately clear. An Afghan official has reported a loud explosion in the capital Kabul. Nasart Rahimi, deputy spokesman for the Interior Ministry, says there are no immediate details. No one immediately claimed responsibility for the attack, but both Taliban and Islamic State group insurgents are active in Kabul. The explosion comes after at least 30 civilians were killed, along with 16 Taliban fighters, by government forces battling the insurgents in Helmand province overnight. An Afghan official says that at least 30 civilians have been killed, along with 16 Taliban fighters, as government forces battled the insurgents in Helmand province overnight. Attahullah Afghan, who heads the provincial council, says most of the casualties — including men, women and children — incurred in an airstrike that hit a house on Tuesday night during military operations there. A statement from governor's office in Helmand confirmed that 16 Taliban insurgents were killed and said an investigation was underway to determine civilian casualties. It says the militants had stockpiled ammunition in the area of the operation, which could have caused civilian casualties. There was also a car packed with explosives that ignited during the strike. Qari Yusouf Ahmadi, a Taliban spokesman, claimed all the victims were civilians.